A demanding day-to-day life can wreak havoc on our skin, exposing it to pollution and other toxins. 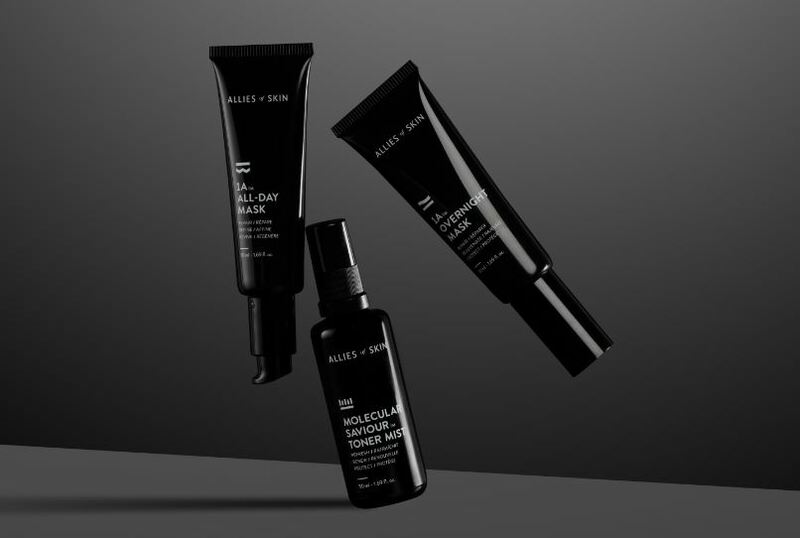 Powered by potent antioxidants and intelligent nutrients, Allies of Skin is your accomplice in the battle for a healthier complexion, enhancing natural healing with powerful actives in concentrated formulas that repair, regenerate and retrain your skin to perform at its best. Each product works synergistically with your skin to adapt to your specific needs. Stimulating collagen and elastin, encouraging cellular renewal, and inhibiting melanin formation, the cumulative outcome is skin at its healthiest. This game-changing sleep peel delivers the effects of a professional facial overnight. Active ingredients, including AHAs, retinol and probiotics, are encapsulated inside a pure, high-molecular-weight hyaluronic acid gel that slowly releases the ingredients while sleeping. Skin will be exfoliated and nourished twice as much as traditional peels without the usual irritation. 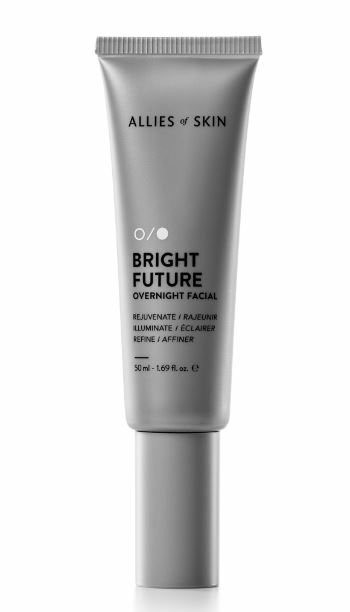 Refines and reduces the appearance of large pores while reducing breakouts and blemishes. Provides a mega dose of healing hydration overnight and promotes a healthy glow. Tips: Once per week, apply a generous layer for 2–3 successive nights. Do not layer with any serums or moisturisers, which may block the acids from working. Always use an SPF the morning after. Supercharging skin with peptides, antioxidants and anti-inflammatories, this leave-on treatment fuses the potency of a mask with the easy application of a moisturising cream Its nutrient-rich reservoir plumps skin with moisture and nutrients throughout the day with over 35 powerful actives, healing and calming while reversing the signs of stress and fatigue. Brightens, tightens and refines while increasing production of collagen and elastin. Hydrates and repairs while reducing redness and calming inflammation. Protects and purifies against toxins; clinically proven to reduce acne lesions by 36% in 28 days. Tips: Apply daily to the face and neck, and do not rinse off. Can be used morning and night, alone or under SPF/makeup. Treat it like you would a moisturiser, and apply after your favourite essence or serum. Packed with an abundance of cell-energising, reparative actives like Indian ginseng and pterostilbene, this nutrient-rich mask works while you sleep to boost the skin’s immunity and accelerate cell renewal, breathing new life into dull, sallow skin. Ally-R™ technology is a stabilised form of retinol that combats blemishes, smoothes wrinkles, and reverses sun damage – all without irritation. Speeds up cellular renewal while brightening and nourishing dehydrated, dull skin. Stimulates collagen and elastin, improving pore size, fine lines and wrinkles, and skin texture. Clinically proven to reduce non-inflammatory acne lesions by 67.2% in 28 days. Tips: Leave on overnight and do not rinse off. Treat it like you would a moisturiser, and always apply an SPF the morning after. If you have a favourite essence or serum, use before application. This alcohol-free mist refreshes thirsty skin on-the-go while providing restorative antibacterial protection. The perfect remedy for the dehydrating effects of air conditioners and frequent flying, its anti-evaporation molecule clings to skin cells for lasting hydration, while a smart blend of antioxidants and probiotics soothes, tones and refines. Anti-evaporation molecule clings to skin cells for a heavy dose of hydration. Soothes sensitivity, balances pH levels, and refines pores. Rich with probiotics, nutrients, antioxidants and antibacterial properties. Tips: Close your eyes and gently spray over the face and neck. Apply throughout the day, even over sunscreen and makeup. Store in the fridge for added refreshment. This time-saving treatment kit contains a trio of high-performance nutrient reservoirs that protect, refine and boost the skin's natural restorative abilities. 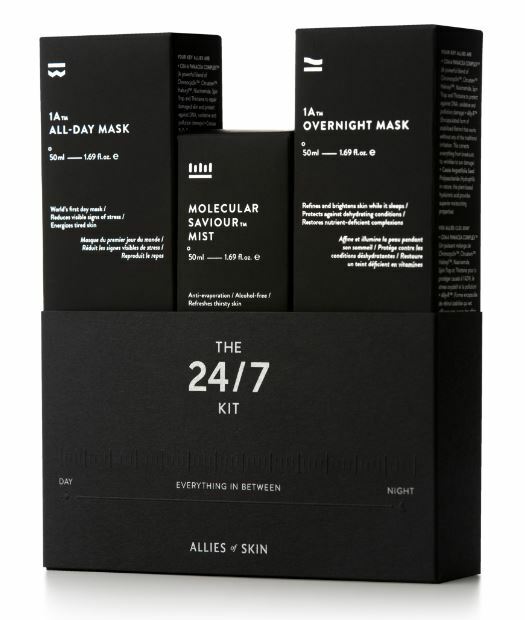 The 1A All-Day Mask (50ml), 1A Overnight Mask (50ml), and Molecular Saviour Mist (50ml) work together to revive a tired complexion and give it a complete overhaul. Molecular Saviour Mist refreshes thirsty skin while providing antibacterial protection. 1A All-Day Mask boosts hydration, firms, and protects against pollution. 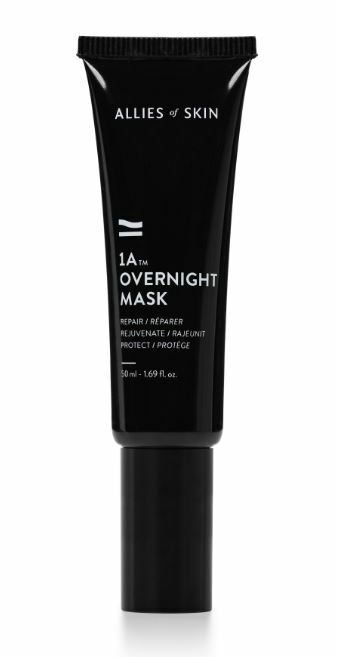 1A Overnight Mask detoxifies and nourishes stressed skin while improving radiance and texture. Tips: After morning cleansing, spray Molecular Saviour Mist onto the face and neck, avoiding the eyes. Massage in the 1A All-Day Mask like a moisturiser and do not rinse off. At night, spray Molecular Saviour Mist after cleansing and apply the 1A Overnight Mask (do not rinse off). 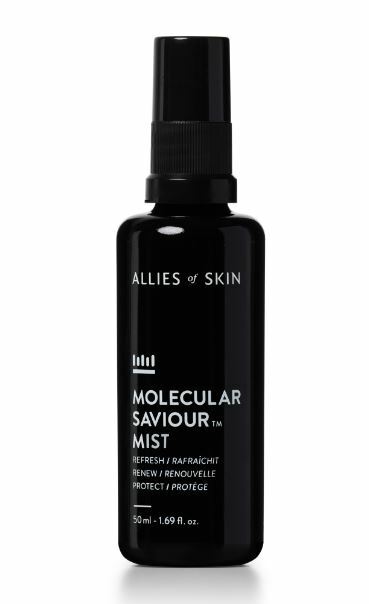 Allies of Skin creates smart, effective products for the modern ‘multi-hyphenate’ — the active, on-the-go person. Embodying effortlessness, speed and efficacy, this back-to-basics beauty brand tackles common skin stresses, such as pollution and sun damage. Using powerful antioxidants and proven nutrients, this three-step ritual for tired, stressed and problematic skin is straightforward but phenomenally hard-working, protecting against pollution while hydrating and repairing.